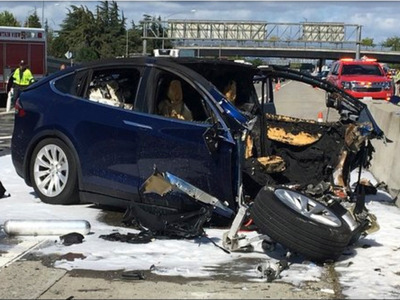 KTVU via Associated PressThe aftermath of Friday’s Model X accident near Mountain View, California. A Tesla Model X caught fire after crashing into a highway barrier in Mountain View, California, on Friday. It’s unclear what caused the accident or whether Autopilot was engaged before the crash, but Tesla revealed that the software had been activated around 85,000 times without any reported incidents on the section of highway where the accident occurred. Tesla also said that a shortened impact attenuator may have increased the damage caused by the crash. A Tesla Model X caught fire after crashing into a highway barrier in Mountain View, California, on Friday. The car’s driver, Wei Huang, died after being taken to the hospital, The Mercury News reports. On Tuesday, The National Transportation Safety Board said on its Twitter account that it would investigate the crash. The agency said it’s unclear whether Tesla’s semi-autonomous Autopilot system was activated before or during the crash. Tesla also released a statement about the accident in a Tuesday blog post titled, “What We Know About Last Week’s Accident.” In the post, the company said that it hadn’t been able to retrieve the vehicle’s logs yet. Still, the post revealed a few insights into what happened in the crash. The first is that Tesla’s data indicates the company’s vehicles had driven the same section of highway where the crashed occurred about 85,000 times with Autopilot engaged since the software debuted in 2015 – and around 20,000 times since the beginning of 2018 – without any reported accidents. The second is that the impact attenuator near the area where the Model X crashed appears to have been shortened before the accident. An impact attenuator is a safety barrier, found on highways, that’s designed to reduce the impact when a car crashes into a concrete lane divider. Photos included in the post show the attenuator at a much shorter length the day before the accident than it had been previously, which Tesla believes increased the damage caused by the crash. The NTSB’s investigation is the second this year involving a Tesla vehicle. The first came in January, after a Model S hit a fire truck in California while Autopilot was activated. The fire truck was parked in the emergency lane on the side of the highway while responding to a prior accident, according to The Mercury News.